I see now. I did not scroll down far enough: http://rotorbike.com/catalog/default...3d-cranks.html. It lists only 170-175 in the written description, but the chart farther down shows the other lengths. This is what confuses me, too. I can confirm that the 150mm ALDHU3D crankarms exist and are available because I have two pair. Ken is also like 5 feet tall. You're generous. He's 4'11" last time I check the mirror. * Higher peak cadence (20-25rpm net gain). * Higher saddle height; more aerodynamic position. * Higher effective gear (old 92" becomes 95-96" roughly). * The need to reglue chainring bolts every 2-3 months! It boils down to personal preference after everything is said and done. However, metrics tend not to lie. Hope this helps! I'm not saying you didn't see aerodynamic gains, but can you expand? In my experience this has not usually been the case. Yellow line is 170mm crank and blue line is 165mm crank. It was the same position. It's just a bad screenshot. So same head position and others. That's why the yellow line is lower than the current head position. His hip angle also decreases by ~ 5°, the opposite of what would happen by moving to shorter cranks if the position had stayed the same. The shoulder angle (bend at the elbow) decreases by ~8° as well, tightening everything up. This doesn't happen from 5mm crank length as the only change. By dropping his head and rotating his hips he has dropped into a more aerodynamic position. 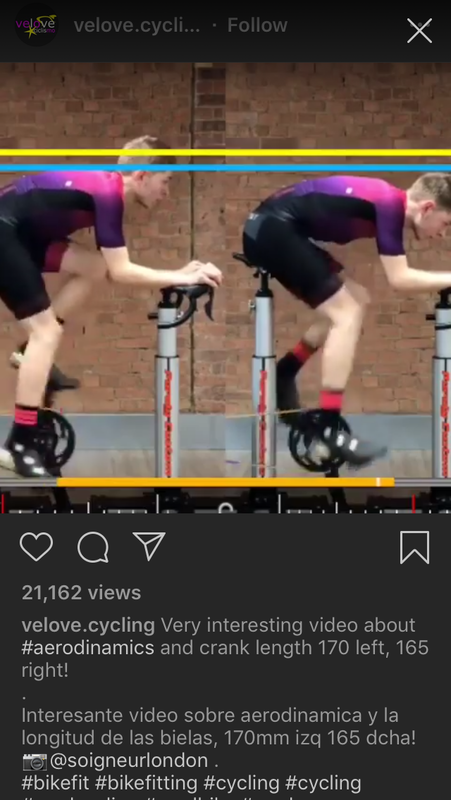 Short cranks can indeed help with that SOMETIMES but too often someone jumps on the internet, reads 30 minutes on Slowtwitch and jumps to drastically shorter cranks... the same way time triallists 10 years ago thought you needed 180+mm cranks to produce more leverage. Fwiw I think he has a good fit, and it looks aero. I just think the forest is getting lost in the trees a bit. Extra 20-25rpm per 10mm shorter crankarm? This is A LOT. That would mean that between 165 and 170mm crankarms length would be about 10-12rpm difference? This is where I am confused. You increased in cadence AND gear ratio simultaneously? Or that your absolute speed stays the same with lower ratio, shorter crankarms and higher cadence? I believe the second, just want to be sure. What is a reason for this? Higher cadence makes more vibrations than smashing? I did buy the 150 cranks from Rotor, and I have had several comments concerning how much better I look on the bike when I am in an aero position (handlebars are Scattos). I must be more aero, because my speeds are up and my times are down, and nothing else has changed, except for me getting even older, which I am pretty sure is not enhancing my performance any. Doubt the cadence gain will be linear like that. Perhaps a better conclusion might be: the closer the optimal crank length, the higher peak cadence. Shorter cranks, less leverage. That makes the gearing effectively taller. Ever serrated chainring bolts won't stay put in the Power2Max spider (a known issue) and they keep spinning. J-B Weld holds the best but needs to be reapplied every few weeks (3-5 ring swaps per week on average). Short people tend to be on cranks that are too long, unless we seek out aggressively shorter-than-ordinary cranks - stuff below 165. Being on "too long" cranks means that we tend to have positions that are more upright than, say, the 'platonic ideal' of bike positioning - so that we can have a hip angle that can produce power. Or, hell, just so that we can get our legs over the top of the stoke. But when we shorten the cranks, we can raise the saddle, pitch our torsos forward, and start to approach that nice-looking position. ^I'm not at all saying short cranks are wrong, or won't make you more aerodynamic. They can. For the 5'5 woman 170's that came stock on her bike likely are too long. For the right bike/position/person, 155's or shorter may be right. All I'm saying it that people don't understand what is often making them more aerodynamic. This athlete changed nothing in equipment between these two runs. There is a 15 watt difference between them. That's in the most controlled setting you can have testing differences in aerodynamics. What he is referring to is what Shelton Brown calls 'gain' ratio.